Check out Grimecraft’s triumphant return to GameChops with a killer remix of one of gaming’s most memorable soundtracks, Donkey Kong Country – Aquatic Ambience, just in time for Halloween! Speaking of, have you checked out our Halloween EP? Get your spoop on with 8 tracks from some of GameChops best producers! Have you ever wished you could play all your favorite retro games on an original Game Boy? Ever tried to play Donkey Kong Country one? “But there aren’t enough buttons!” How naive of you, rhetorical person made up for the sake of this opening paragraph! Behold the Game Boy you never knew you needed more than anything else… until now. Super Donkey Kong Country Remix Album Double-Post!! 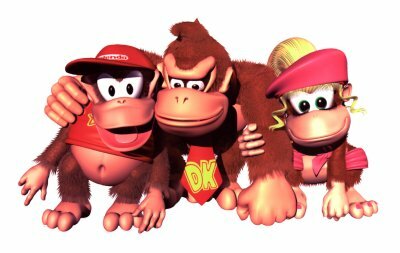 I love Donkey Kong Country as much as the next person who enjoys tediously difficult super nintendo games, and turns out I’m not the only one. Both OverClocked Remix and DK Vine have created their own massive DKR remix albums. And they’re both free! OverClocked Remix’s “Double The Trouble!” is a ridiculous 77 song compilations featuring remixes from 69 individual artists in a variety of styles. The album is available for free download via dkc3.ocremix.org. DK Vine’s “Chip Country” is a 30 track 8-bit remix album featuring chipmusicians like Iron Curtain, Heavy W8bit, MyLifeIsPixels, 8-BITchin’tendo, PolarBirds, and Nestrogen. It is also available for free download viaDKVine.com. Download Double The Trouble! via OCRemix.org. Download Chip Country via DKVine.com.